the EPF strict curling record for Massachusetts. 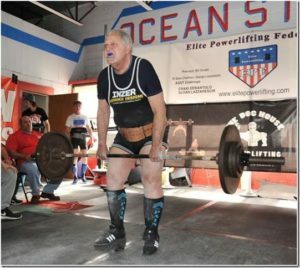 The 79-year-old Sares lifts full-power, classic raw and recently won his third consecutive Grand Maters EPF Nationals held in Johnston, Rhode Island. Moultonborough, a 215 -pounder named Josh Cahoon got an amazing 2100 pound total using gear. that I needed to do something that would restore my physical confidence. Powerlifting was the answer. unique experience, especially for someone my age. Who inspired you to lift weights? Strongman contest and met some super people along the way. I will be in events this coming September (VT), October (NH), and November (RI). (VT), October (NH), and November (RI).